Slate tile floors are a fine-grained metamorphic rock which radiates a subtle, natural and truly unique beauty. A beautiful choice in rustic settings, it can also be used effectively in formal settings as well. 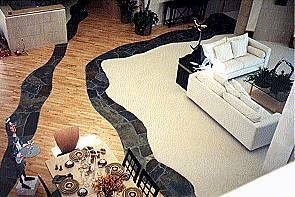 Slate is naturally stain resistant and relatively easy to install. Slate tile, like fieldstone and ceramic tile, maintains heat well, making it a good choice for passive solar homes. Because slate resists fading, abrasion and is chemically resistant as well as being impervious to freeze and thaw cycles, its beauty will last for years to come. Slate tile is recommended for both interior and exterior applications. It does however have one minor drawback and that is it could scuff in heavy traffic areas. It may periodically need to be buffed or even waxed to keep it looking good. It is not recommended for exterior or interior floors that are subject to water or grease accumulation. For more information on this and other natural stone flooring products... FloorBiz is your starting point to all the important slate tile flooring sites on the internet.